Many pre-teens, teens and some adults require braces to fix crowded or crooked teeth or poor jaw alignment. At Bundoora Dental Clinic we are able to determine whether orthodontic treatment is necessary for your child. Teeth that do not fit together correctly are harder to keep clean, have a greater chance of being lost early and can cause extra stress on individual teeth and chewing muscles. An orthodontic evaluation will determine if you or your child needs braces and what type of treatment is required. We would then refer you to an orthodontist for application of the treatment. 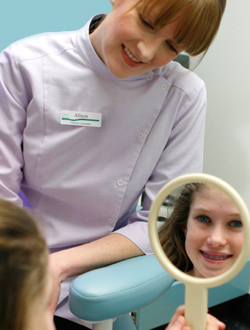 If you or your child has braces, our friendly staff can advise on the correct way to maintain oral hygiene including how to properly clean teeth and look after gums whilst wearing braces. For an orthodontic evaluation, please call our friendly staff on 03 9467 3733.